A new twist on the old boring Rice Krispie Treats! 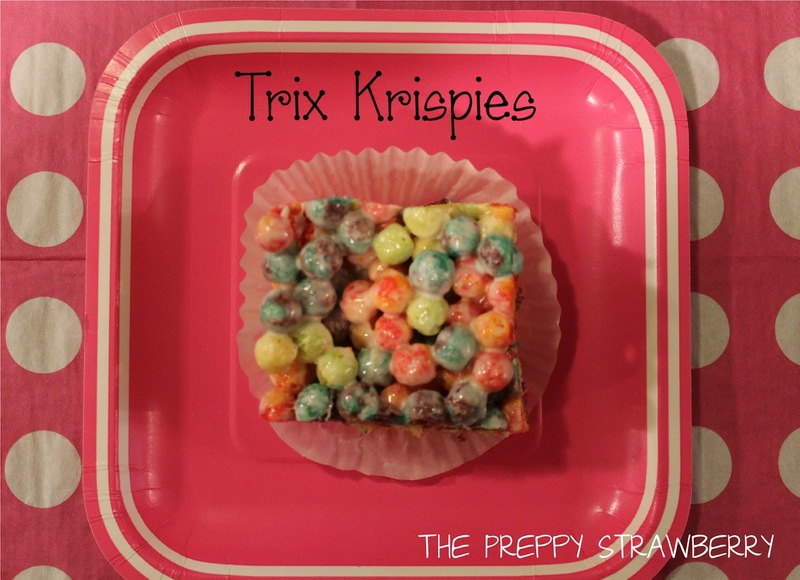 Don't get me wrong I still love homemade Rice Krispie treats but last night my daughter and I whipped up some Trix Krispies! These are delicious .. even adults love'em! 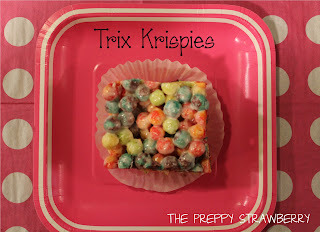 Guess, Trix really aren't just for kids? I googled a few recipes and one recipe said 2 cups mini marshmallows and another said one bag to 10 cups Trix cereal. I was a little concerned about the little amount of marshmallows since the Trix cereal is bigger than the rice krispies. I adapted my recipe to (2) bags because one bag was not covering the 10 cups of Trix cereal the recipe called for and I'm glad I added the extra bag! They are extra gooey! I think our Canadian bags of marshmallows are bigger than the US ones so for Canucks one bag is perfect. Aren't they just so much fun to eat. Weird how just switching up the cereal makes them so much more fun. Lol. I love the pam trick. Makes everything I smash down so much easier.